As a newbie to yoga, there is definitely a lot of things that you have to know. Yoga for beginners can be overwhelming. Nevertheless, it is a sure edge if you gain very good understanding about Hatha yoga. This will allow you to experience safe, enjoyable and fulfilling yoga. The word Hatha comes from the two terms “ha” which means the sun and “tha” which means moon. Hatha Yoga is all about achieving harmony, balance and unification of mind, body and spirit soul. This practice requires great willpower and discipline. It is a physical technique that helps prepare the mind and body for effective meditation. Correct breathing is crucial in the practice of Hatha yoga for beginners. Hatha yoga is not only about perfecting the yoga pose. Aside from the external abilities to twist the body, we should be more mindful about the workings of our breath control or pranayama. In this way, we can get the full benefits from the yoga pose. You must fill your chest and fill the abdomen. It makes you aware of the contraction in abdomen, you must first start with the abdomen, then empty your lungs and let your chest fall. Inhalation brings nourishment and energy. Retention or holding of the breath in allows the prana or life force to fully enter and energize. Exhalation cleanses the system and quiets the emotions. Suspension or holding of the breath out extends the benefits of the exhalation by further calming the body. Full deep breathing that includes all four stages properly fuels, energizes, cleanses, balances, and releases the entire system. It is best though to begin by simply focusing on the exhalation. In Hatha yoga, each movement must be guided by breath. However, while doing hatha yoga exercise, remember not to be over conscious about the proper breathing. Otherwise, it will just make you tense around the chest, shoulders and neck. Well, this is vital to learn in yoga for beginners. Once you are able to make your exhalation long, smooth and steady then the rest will automatically follow. Yoga postures, especially inversions and those that compress the abdomen are not good on a full stomach. Listen to your body-if you practice too soon after eating or drinking, certain poses will definitely feel uncomfortable. It’s best to practice asanas barefoot, using a yoga mat or other nonslip surface for standing poses. A mat, rug or folded blanket will provide firm padding for other asanas. Wear comfortable clothing, something that allows you to move freely. Ideally, the room should have good ventilation. Have enough space to extend your arms and legs out in all directions without hitting anything. While practicing, concentrate on the feeling that the asana is producing in your body. If you feel too week or shaky in a pose, come out of it. Gradually you will build up your strength and be able to hold the pose longer. Keep in mind to give quality relaxation for every yoga pose that you perform. Don’t go beyond your personal limitations, but extend your boundaries gently. Doing the asanas correctly means doing them safely and to the best of your ability. Hatha yoga is not a competitive type of exercise so just try to enjoy doing a pose. 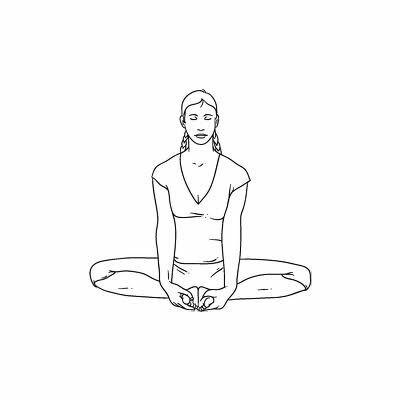 You can gradually learn or master a difficult pose by patience and constant practice. Nevertheless, you will be more aware of your body movement in the long run. Moreover, do not go beyond your personal limits as it will only cause you injury. Simply rest and relax in hatha yoga for beginners. overall improvement of health and wellness. You can absolutely gain a lot from practicing Hatha Yoga. Aside from relieving stress, you can achieve healthy and fit body. More so, doing yoga also has anti-aging effects! Everything in the body is connected to the spine. As a matter of fact, the strength and flexibility of the spine determines the real age of the body. Unhealthy spine can make a person susceptible to different ailments or disease. The functioning of different body organs can improve by ensuring the health of the spine. It is a good thing that the primary physical focus of yoga for beginners is the spine. Believe it or not but you can actually smooth away the wrinkles on your face with regular yoga practice. You can also achieve healthy glowing skin because of the oxygenating and rejuvenating effects of yoga. Yoga for beginners can relieve back pains and as a result, you can sleep and rest better. Moreover, levels of melatonin and endorphins or happy hormones increase. Weight gain also slow down. Most people only do shallow breathing. Therefore, they only use a little bit of the 5 quarter lung capacity. Coordination of breathing and movement is what makes the hatha yoga distinct from other types of exercise. Good coordination of movement and breathing can help improve concentration, clearer head space, dissipation of stress and strong emotions like anger. More so, yoga also improves the functioning of the all bodily systems. Yes, yoga can bring healing effects for injury. It can speed up the recovery of the body from back muscles injury. Most of yoga poses are modifiable to meet the needs of both young and old students. Firstly, you should know your dosha. There are varied ways to learn yoga according to one’s body type and constitution. Determining your dosha can help you learn yoga asanas with the most appropriate learning style. Ayurveda offers the oldest healing systems. It is India’s wonderful gift to the world. There are three different types of human body-mind classification by the Ayurvedic System. It is called the doshas. It is the unique physical and mental constitution, which heavily affects the personal well-being. Different individuals may react differently. Therefore, an effective teacher of yoga for beginners utilize different strategies for students. Knowing the Doshas is very important in order to determine the characteristics or qualities of a person. The three Doshas are known as Vata, Pitta and Kapha. Normally, each person is a unique combination of these three Doshas. Learning the characteristics of each can help individuals to understand how to successfully learn yoga for beginners. The description for doshas are fairly general. it is imperative to note that in rare cases, some folks may have a dual dosha or combination of two and sometimes three doshas. The dosha is the blueprint that you have since birth with and will not change. However, it may go out of balance. There are factors that can aggravate the doshas and you need to pacify it. Therefore, the goal is to get back to the state of balance and it is possible. Persons who have pitta dosha usually have medium height and body frame, they can be slender. More so, they also have medium prominence of veins and muscle tendons. The muscle development is also moderate. They have the tendency to be intense, ambitious and passionate. They need to avoid holding inverted poses for long period of time as it can cause a lot of heat in the head. Individuals with kapha dosha generally have well-developed bodies. They have the tendency to carry excess weight. Moreover, their chests are expanded and broad, veins and tendons are not obvious. They have good muscle development as well as good stamina. However, they usually move slowly with a tendency to laziness. People with kapha dosha needs stimulating and energizing yoga practice. People with vatta dosha may have underdeveloped muscles. Most of them have the tendency toward flatter chests. Their veins and muscle tendons are protuberant. Generally, they often have dry and cracked skin. Nevertheless, they are often out of proportion. Meaning, some of them can be very tall, too short and can have thin frames. They have the propensity to move quickly with fair flexibility. However, they are very easy to distract. The calming and grounding yoga poses are recommended. Yoga for beginners could be one hundred percent fun as long as you practice it correctly and safely. Hatha yoga is an amazing method to feel more connection to one’s self. It offers a special time to let go of whatever consumes you and be free. Yoga is a low impact exercise that you can do for the rest of your life. Yes, even when you already reach old age. It can still be very empowering and life changing. Nevertheless, yoga offers a brilliant way to discover one’s self. It is an amazing way to learn how to listen to your inner voice and gain trust in yourself. Introduction to Standing Forward Bend-Uttanasana.